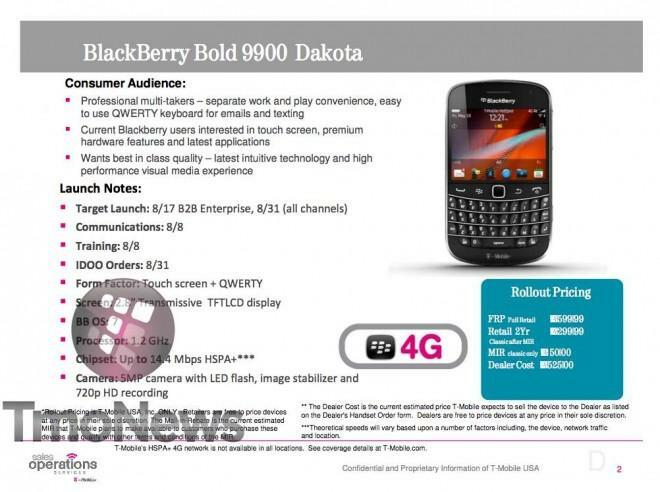 Not convinced by yesterday’s Blackberry Bold 9900 release date leak? We’ve got yet another document confirming the very same thing but with one extra bit of information: a $299.99 after $50 MIR rebate. The Blackberry Bold 9900 will be T-Mobile’s first 4G Blackberry with HSPA+ capability up to 14.4Mbps. Sounds good Blackberry fans? We thought so…peak the rest of the doc for more information on things we mostly already knew. Me..I’ll just staring lovingly at the “4G” symbol. $299 after MIR on a two year for a blackberry? makes me thankful i got the htc sensation instead. Does anyone know if TMO will carry the Torch in the near future? I was looking forward to this phone but at $349 before the rebate and a 2 year contract, gotta say I’ll pass. Especially with the possibility that this phone may lose it’s 3G capabilities prior to the end of a 2 year contract if the ATT buyout goes through and ATT follows through with their plans to reappropriate T-Mobiles 3g spectrum. Currently the most expensive phone T-Mobile offers on contract is $249 before rebate. Something tells me that this is part of move to push users away from Blackberry and to more data intensive phones like Android and possible Iphone. More data = more $$$ for the the company. 349 upfront? are you kidding .. the Sensation and g2x is cheaper ..
Well said! Who wants a phone that freezes up all the time (G2x) and where the volume buttons randomly fall out (known Sensation issue)? I hope that price isn’t right – if it is this phone is going to flop. Seriously… do any of you remember browsing the web on a blackberry, those arrows at the type right flashing so fast giving you a seizure whereas an android phone just sorta chills for a second and then BLOP the whole page is straight done. Good luck with this, and I will continue to steer customers away from BB until they come out with BB messenger cross platform, and put a capactive touchscreen 4.3″ to the table. You are retarded and know nothing about the relation between network speeds and RIM’s compression methods. Just stop talking now please. I agree, and for you to “steer” customers away from something that might be a perfect fit for them is just downright dirty, you ought to be ashamed sir. Lol, they must be referring to the theives that steal our demo phones every month. Even tho I don’t care for this phone, I thought it was gonna be touch screen? This looks interesting, since it’s supposed to be a touchscreen( although only 2.8 in.) with BlackBerry 7 on it and liquid graphics, supposedly makes it very smooth. I look forward to playing with this one. There’s a few you tube videos. It looks interesting. WOW!!!!! Talk about redundant on my part…Sorry guys. Supposedly the processor will run 1.2 GHZ. $349 up front? After ten years, it may be time to say goodbye to Blackberry. The phones are no longer innovative, there are really no remaining features that aren’t more advanced on iPhone or Android, and there is no reason for a half screen phone any more. I don’t %$#@! care that the Torch is a carrier exclusive, they need a full screen phone on EVERY provider, not just one. This isn’t five years ago! Ya, the myTouch 4G Slide is $200 w/dual core processing. Much better deal. Did anyone bother to read the bottom of the image? That hot sheet is for T-Mobile “dealers” (i.e. not corporate retail locations). It also explicitly states that dealers may subsidize the device however they want. There is no reason to assume that in the corporate sales end it won’t be $249.99 with a $50 rebate ($199.99) like the Bold was when it launched. And yes, the device will be able to punch out “4G” speeds. You’ll get your BBMs faster than light. With no front facing camera too?!?! This can’t be right. It just can’t be. For corporate phones that are public, Blackberry is the only possible phone because of the encryption and security provided by the Blackberry Exchange Server. As a way of following SOX requirements thanks to Enron and Worldcom. (Unless you want to one of those paid services). Microsoft Exchange Active Sync provides very little in this way. Lost phone BES can wipe device, Active Sync can not. BES can force a policy for passwords, Active Sync can not. When your Active Directory password expires, The user has to reload it on those other devices. Not so with Blackberry. For most of my users this is not something they can figure out. camera specs? and is its mechanisms as quick as the 8900 shutters/motor? Price isn’t too bad. And I’d definitely take this over the iphone. Ugh. Hate those things. That’s too much for a BlackBerry with a two-year contract. I don’t wanna pay more than $200. 3 words that best describes this phone is Fast, Smooth & Smart. Might be a good choice instead of that GIANT hercules …. The back of the box also show NO UMA or WiFI calling. That is a HUGE negative for this phone. Does anyone know if it is possible to get unlocked version of Bold 9900?